I am so very sorry. This is a huge loss. My solace to you and her family—and thank you so much for telling us. So sad, my thoughts are with you and the rest of her family and friends. Jenny was such a good friend and so accomplished in many ways. I had known her for 30 years. We had hiked a lot with the SMHC and had led a hike to Cammerer in the late 80s. She had so many talents beyond her beloved hiking and exploring. God bless and good bye dear friend. Thank you very much Peter for the update. I am so sorry for your loss. I miss my friend. I see reminders of her daily. So thankful for having known her. This is a shock. Though I never met Jenny, I feel a huge loss. I felt a connection to her through her blogs and love of hiking and the outdoors. Condolences to you, her family, and all who shared her love of nature. ” to the above and her 1st book. May God have mercy on her soul. Peace to all who knew her. This is a terrible loss. I’ve hiked with Jenny dozens of times in New England, California and Colorado, usually also with her former companion, the late Bob Parlee. She was an amazing woman. Few were as passionate about hiking and writing about it than her. I learned much from her extensive knowledge of local flora and fauna. Hard to believe her and Bob are both gone. The mountains will never be quite the same. I am heartbroken by this news. I was looking forward to welcoming her back to New England and seeing her in the Northeast Kingdom next month. She was an adventurous spirit, a kind soul and a good friend. Thanks Peter for letting us know. I first hiked with Jenny 40 years ago in Maryland and Virginia, last a few months ago a few months ago in North Carolina. I’m sorry we don’t get a few more decades of her company. Very sad to read this, but thank you for telling us Peter! I worked with Jenny for about a year in Dover, NH, around 2007, and whenever we could we would talk about hiking, especially in the NH Whites. We joked that she was my “hiking consultant,” as it was a new addiction for me and she was full of great advice and the “evangelism” of the hiking life. She was a wonderful, fascinating person. She’s obviously left us too soon…but if it had to be, it certainly happened while she was following her passion. Losing Jenny is a tragic loss. Jenny was the partner of one of my close friends, Bob Parlee, who died last March. For about 15 years the works “Bob and Jenny” were always linked together by the words “hike”, “ski”, or occasionally a bike ride. My wife and I have treasured photos of or time sharing Jenny’s company. Jenny enjoyed learning and sharing her knowledge. I hope she finds peace wherever she is now. She will me missed. A new and cherished friend, I will miss Jenny so much! We first became acquainted on her blog, then via email. We met in real-time in August of last year, and did several hikes together. 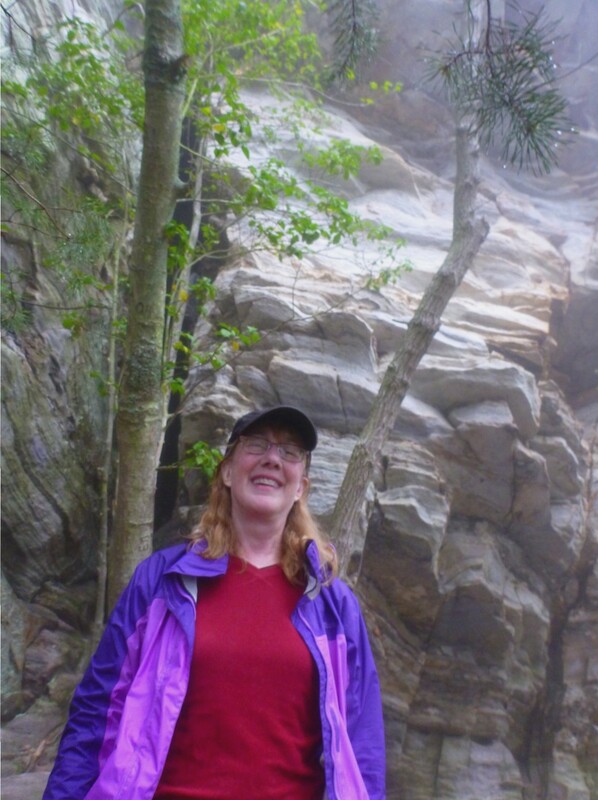 She quickly became a mentor for me, as I had become passionate about off-trial hiking. She educated me more on the Smokies in a very short time than anyone since I took up hiking four years ago. May you be at peace, my friend. Peter, please accept my deepest condolences to you and your family during this difficult time. Peter: Thanks for posting. Please accept my condolences for Jenny’s loss. For my part, I am still trying to wrap my head around it. It is strange to think of such a unique, quirky, strong, artistic, smiling, love-filled individual gone. Where could that uncontainable bundle of life-force go? I only hiked with Jenny once, but we corresponded for years and I was a great fan of her blog and her books. She will be missed by many people. I know I will miss her. My condolences. I am saddened by Jenny’s loss. She was such an inspiration and I always looked forward to reading her latest adventures. Her’s will be huge hiking boots to fill. Visiting here was like going along on a hike with Jenny. She will be missed. My condolences to her friends and family. i am unable to attend the benefit hike and would like to know if there will be a memorial fund ? It would be nice if Jenny’s blog could be preserved through donations . Peter … I am very sorry for your loss and for the recent sad news.